I was married to a man that was nice and kind, but not passionate or connected. I was in a career that kept me striving, but never really thriving or knowing my value. A four-bedroom home in the suburbs and a good-looking husband that I had love for but I was not in love with. Investment and retirement accounts, annual vacations, but also numbness and boredom, a life I needed an occasional escape from. I was at least 20 pounds overweight, working long hours in what was probably an enviable career that paid well, but hid who I really was and depleted my soul. 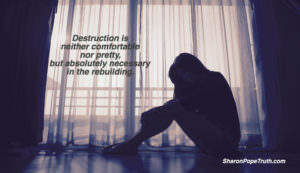 Destruction Isn’t Typically Neither Comfortable nor Pretty. I had been feeling the emptiness of my life for a while, but had spent years attempting to convince myself that what I had was enough. Until someone came into my life that that woke me up and filled me with adoring love and excitement, passion and connection. He made me feel things I had never felt before and frankly, didn’t even know existed. From my lost and foggy existence, I ran towards that possibility, thinking that was the answer: The possibility that what we had was real and what I felt could be sustained. It was almost like an addiction: I knew it was wrong and I knew it wasn’t good for me, but I couldn’t seem to turn away. I walked out of my marriage and hurt my husband. My family had no idea what was happening. I went through the daily motions of my job, knowing it didn’t fit, but not in any position to take any real action. I was lost. I was confused. I didn’t handle the challenges I faced with either grace or ease. And when that relationship ended, I found myself in a heartbreak I had never known previously. Clearly, I wasn’t a Love Coach then and didn’t have any tools, so I made more mistakes than necessary. The decisions I made so many years ago blew-up my life. But the life I had wasn’t a good one and frankly, it needed to be blown-up. I had been far more pre-occupied with what my life looked like to everyone else, as opposed to actually living a life that felt truly authentic to me. I had traveled so far away from who I really was, I didn’t even recognize that woman looking back at me in the mirror. And that’s where my journey to awakening really began. That’s where I began to realize who I was and what I really wanted. I awake each day in the arms of a love that is both deep and wide. I created a business and life that feels like home, at home in my own soul. I’m surrounded by people and friendships that help me grow. I am no longer afraid to look within, because I know that’s where all the answers lie. I am at peace now and it feels really, really good. Sometimes, when it feels like nothing in our lives quite fits, we need to experience some destruction so that we are forced to rebuild. It never feels comfortable as we’re going through it, but when we allow our inner guidance to take the wheel, where we ultimately land is far, far greater than anything our minds could have created from back in the pain. What in your life is crying out to be rebuilt? Maybe I can help. If you know something needs rebuilt (and maybe even destroyed first), but that scares the living daylights out of you, I would encourage you to work with a specialist that has been there, done that, and knows the way through.